One tree won’t hold two robins. The Clay-colored Thrush (Turdus grayi) is a common Middle American bird of the thrush family (Turdidae). It is the national bird of Costa Rica, where it is well known as the yigüirro. It was formerly known as the Clay-colored Robin. It ranges from South Texas to northern Colombia. It is limited to the Atlantic slope, except for a population around Oaxaca City that probably originates from escaped cagebirds. The Clay-colored Robin is unlikely to be confused with other species in its limited United States range. In much of its range it is familiar in yards and gardens, similar to some other thrushes such as the American Robin, the Eurasian Blackbird, and the Song Thrush. 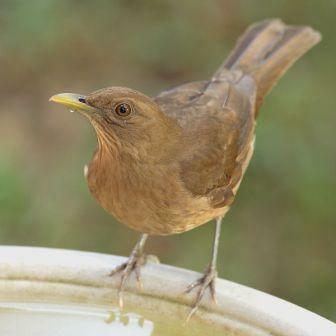 The Clay-colored Thrush usually forages for fruit or invertebrates on or near the ground. Flocks may feed high in fruiting trees. This Thrush will follow army ants to feed on small prey disturbed by the ant columns. It builds a heavy cup nest of grass, moss, and mud on a firm support above the ground. It is aggressive in defense of its nest, but generally is not particularly territorial. Bird, birds, Clay-colored Robin, Clay-colored Thrush, Latin proverb, Robin, Turdidae, Turdus grayi. Bookmark. This quote really got me thinking I have to be honest with you, but now I think I have a basic understanding of what it means. Latin proverbs are always interesting to read since they can have such a deeper meaning than you would expect. As for the Clay-colored robin what an amazing bird. I thought there was only one kind of the robin, the red chested ones that are everywhere it is good to know that there is some diversity in the robin world.